Our Isocatamarans are all built to EC, RDC (Recreational Craft Standards) making them eligible for CE marking. The structural designs and engineering being all set and supervised by qualified naval architects. All the materials used in the construction be it fiberglass, resins, wires, switches, etc, are to EEC and the relevant ISO quality standards. Isocatamarans are 100% handmade, the basic construction being upon the "sandwich principle". However our methodology and the materials used are unique to us. We do not use chemical foam in the sandwich, but rather high quality Red Cedar wood, 25mm thick. This cedar wood has a number of distinct advantages. It is relatively light, but has a very high strength to weight ratio. It has good flexibility and is thus able to easily absorb shocks and perhaps most importantly, it does not absorb any water. The hand laid cedar planks, three to four metres long, but only 10cm wide, are all grooved and sealed with high quality waterproof glue, sanded and filled then re-sanded by hand, this combined with the cedars impermeability results in a completely waterproof structure. So much so that if no outer fiberglass were to be applied, once finished and varnished, it would result in a beautiful wooden hulled yacht. A final and perhaps most important benefit, is the virtual prevention of the deadliest enemy of fiberglass boats, "osmosis". Even if the fiberglass is damaged, no water will penetrate. The quality of the fiberglass and resin we use exceeds normal standards and being hand laid enables our glassing experts to monitor very closely the curing process and to stroke out any minor air bubbles which may occur and thus ensure a strong dense layer. We utilise the same construction methods for the saloon, with addition of further re-enforcing in the form of solid fiberglass strips, 100mm wide laid every 50 centimeters. This provides a firm stable structure. It is possible (because we have tried it) to dance on our coach roof, without any movement or flexing, as is sometimes experienced on other production line manufactured boats. The designs of Isocatamarans are our own in-house ones, producing what we feel are innovative and distinctive profiles. However because we offer custom and hand built yachts, we would be delighted to incorporate any customers design preferences, be they lighter/faster hulls or revised interiors, but all would be constructed to our high standards. In this regard our own charter yachts are built as all weather, ocean cruising catamarans and thus somewhat of a speed compromise has been made. This is because we firmly believe that our charter boats should be above all comfortable, reliable and safe. We have in the interior design of our catamarans placed great importance on comfort. 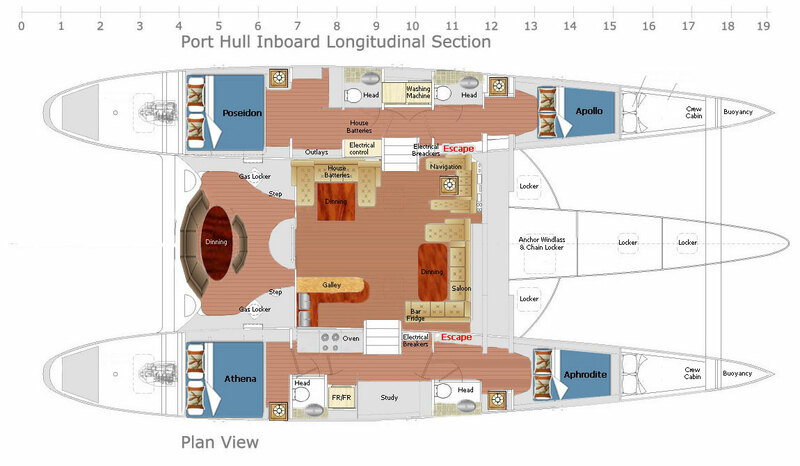 Within the saloon and hulls all the headroom is between 2.05 and 2.25 metres. No more bending for tall people. The stairs down from the saloon to the hulls are similar to the stairs in your house, nicely angled for comfort and safety. The four cabins are particularly spacious. The bed sizes therein ranging from 2.25 metres by 2.00 metres to 1.55metres by 2.00 metres. All the cabins having their own en-suite shower and WC, as well as individual air conditioning units, TV and computer points. We have taken great care with our interior finish, using only high quality oak woods for the flooring and walls of the cabins and companionways, whilst the saloon is panelled with Mocca (walnut) wood with attractive wood grains. The dining and TV settees have a fiberglass frame covered with a high quality upholstery, whilst the dining and coffee tables are again finished in Mocca. See the cabin table at the bottom. The spacious galley is equipped with granite or stainless steel worktops and has been installed with gas and electric hobs, electric oven and microwave. Additionally there is a large fridge/freezer plus a separate small drinks fridge. Entertainment-wise there is a widescreen LCD television, plus DVD and a full surround sound system. Even the workaholics are catered for with an Iridium satellite phone for worldwide communication and e-mail access, including daily weather reports. When required there is also marine tracking and full internet and satellite TV connections. The communications equipment being located at the spacious navigation station. Installed in the hulls are two independent large water tanks, combined with a 100 litre per hour water maker. Drinking water being provided by a tri-system water filter. All sinks and showers are served by automatic water pumps, whilst three of the WCs are electric whilst the fourth is manual. Raymarine integrated radar, GPS, separate wind speed and depth sounds and fishfinder. Twin engine electronic controls at each helm station. Twin stern drive engines. Our preferred engines are Volvos for their high standards of reliability and world-wide service. Our 60 footer being fitted with either a DL75 or DL100 diesels. These being coupled to folding propellers to minimise drag. Marine approved hydraulic steering systems, plus a pre-installed emergency system. We have placed particular emphasis upon the design of our rudders, having had them built to very high specifications. The rudders stocks are custom made stainless steel, whilst the rudders themselves are constructed from stainless steel plates and covered with solid foam and fiberglass. Furthermore for additional security, each rudder is housed within a marine grade aluminium skeg. This having the additional advantage that is it is necessary for the boat to be beached for whatever reason, the stern of the boat is fully supported. On deck the cockpit area is designed to offer maximum functionality whilst simultaneously providing maximum style, safety and comfort. The table and seating area in particular allowing for delightful outdoor, al fresco meals. On our 60ft model we provide twin helm stations for ease of navigation and manoeuvring, particularly in say, marinas. The whole of the cockpit area, including the helm stations, is sheletered by a rigid stainless steel framed bimini covered in high quality Sunbrella canvas. Careful consideration has been given to ensure that moving about on deck is as comfortable and safe as possible, with wide side decks leading to the huge trampoline, constructed from special American material which has minimal stretch for safe walking upon, whilst still offering soft elasticated comfort for the sunbathers or dolphin watchers. At the stern are the twin steps. 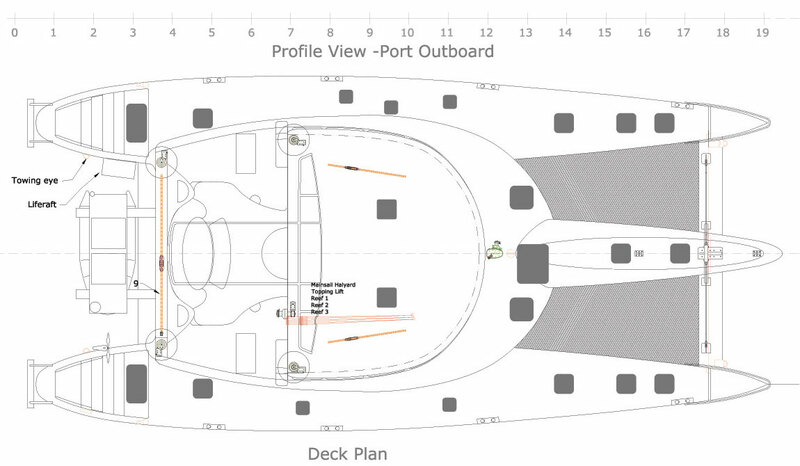 The starboard set also being equipped with an electric hot and cold shower and a boarding ladder. The sail handling is managed by five stainless steel Antal winches (2 Genoa sheet, 2 Main sheet and 1 halyard and reef lines), with all control lines being lead back to the cockpit. The reefing system is a single line one, so that if the need to reef the sails arises, this can easily be done from the cockpit, without the need for anyone to go forward. An important safety consideration. On our boats the winches are all electric for ease of handling, particularly if shorthanded or if one is lacking the strength of youth. Sails are again a matter of individual choice, but as an example, our 60 footer has a 12oz fully battened main, a furling 12oz genoa, a 5oz high cut Yankee, a 3/4oz gennacker and a 12oz storm jib. Our boat is equipped with two escape hatches one in each hull. In addition all cabin hatches are of a size as per EU regulations to also be used as escape hatches in the event of an accident or a fire.